If you're like most Americans, you eat more peanuts than any other type of nut, says the National Peanut Board. High in protein, B vitamins and minerals like manganese, peanuts are also a source of the type of fiber that can help prevent and relieve constipation. Consult your doctor if your problems with constipation worsen or you develop additional symptoms, such as abdominal pain. 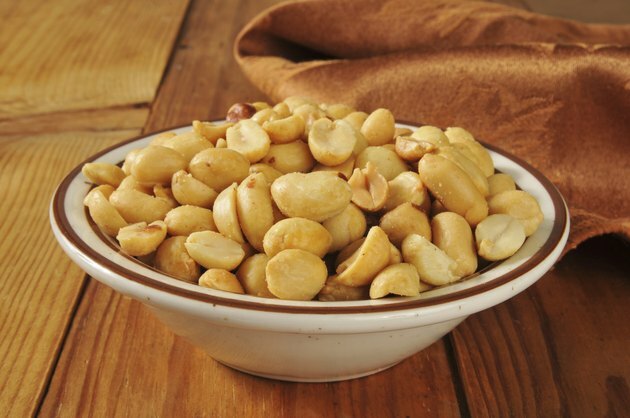 A serving of dry-roasted, shelled peanuts is equivalent to 1/2 ounce, or approximately 20 peanuts. This amount of peanuts contains 1.2 grams of dietary fiber, about 4 percent of the recommended daily intake of fiber for men between 31 and 50 years old and 5 percent of the requirement per day for a woman of the same age. There are two types of fiber -- soluble and insoluble. The fiber in each serving of peanuts consists of 0.4 gram soluble and 0.8 gram insoluble. Adding a variety of fiber-rich foods to your diet is one of the best things you can do to deal with constipation. Foods with a high concentration of insoluble fiber -- such as peanuts -- have the greatest effect on your bowel regularity. Soluble fiber absorbs water in your digestive tract and becomes a thick, jelly-like substance that slows intestinal contractions. By contrast, insoluble fiber doesn't absorb water and increases the rate of intestinal activity. With more insoluble than soluble fiber per serving, peanuts promote intestinal health. Eating more fiber-rich foods like peanuts can ease constipation, says the National Institutes of Health, but don't consume too many. Peanuts have 166 calories in every ounce. Eating them in excess can lead to weight gain and an increased risk of weight-related health problems. In a CNN Health article, nutrition specialist Dr. Melina Jampolis advises limiting yourself to 1/4 cup of nuts or seeds -- about 2 ounces -- per day. Add wheat bran, wheat germ or cooked dried beans to your diet to increase your insoluble fiber intake with fewer calories per serving. To keep your sodium and sugar consumption low, choose unsalted peanuts with no added sweeteners. You might experience some unpleasant side effects if you suddenly increase the amount of high-fiber foods in your meals. Common side effects include diarrhea, bloating, flatulence and abdominal cramps. Minimize discomfort from dietary fiber by gradually increasing your consumption over several weeks. Drink at least six to eight glasses of fluid -- preferably a caffeine-free, non-caloric liquid like water -- every day. ChooseMyPlate.gov: Protein Foods - What Counts as an Ounce Equivalent in the Protein Foods Group? CNN Health: If Nuts Are Healthy, Can I Eat as Many as I Want?